I’m just about to head back north from the Central Coast Writers Conference, which ended last night. After the last session we all headed over to Coalesce Bookstore in Morro Bay. Just walking into this store reminded me of everything I love about independent bookstores and the people and books that populate them. They’ve built a garden and bridal chapel in back of the store, and it makes a fantastic venue for a party. The conference was better in every way than I imagined. It was well attended, with over 220 people on the campus of Questa College for dozens of sessions. There was a teen program, meet the editor sessions, and one of the best groups of volunteers keeping everything moving I’ve ever seen. To kick things off we had a moving and very personal keynote address from Rebecca Rasmussen, a young novelist (The Bird Sisters), who reached into her own past, and that of her daughter, in coming to terms with the question of why we write. It was literary, well-crafted, and inspirational. The first presentation I gave was a breakout in a small classroom, on the subject of organizing your book launch. The second was to the whole group in the closing keynote on successful cover design. In between I met some of the writers who have already published books and, as is common at these events, attendees often ask me to look at their books and give them an evaluation. Or a critique. Or maybe just to see if there are any “errors” in formatting or book construction. I met a 75-year-old author with a lovely small book of poetry and plans to publish more. I pointed out that she could eliminate the colon (:) at the end of her title, and that I’d be much happier seeing the contents on a right-hand page. The Price of Going Local? Then I asked her who was printing her book. It turned out to be a local printer. I’ve often advised people to not use local printers for their book printing (unless you live next door to an actual book printer, of course), and I’ve taken quite a bit of heat for that. But as a printer’s son, I don’t mind. Commercial printers will rarely turn down a job, and some can do a good job on a book. But often they don’t, and authors are much better off dealing with a company that’s a specialized short-run book printer. So I asked the author how much the books cost her, and she told me she was paying $8.00 each. The book is about 64 pages. This is clearly a disaster if you want to make a profit, and I suggested she get one of the helpful young people in the group to help her upload it to CreateSpace, where they will likely cost under $3.00 each. Another author I met showed me her CreateSpace paperback romantic novel. She had done a pretty good job on the cover, avoiding most of the traps amateur cover designers fall into. 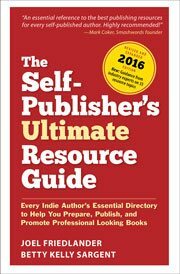 But flipping the book over, I realized there was no category, no price, no author bio, no publisher name on the book, and I mentioned that if she planned to continue to publish, she might think about establishing a publisher name. When I looked at the interior, I was really surprised. The book was quite hefty at 353 pages, which is usually a bad sign. Why? Buyers of genre fiction have pretty strong ideas about what they will pay for books, and that’s one of the reasons these kinds of novels have been so successful in ebooks, where readers can satisfy their voracious reading habits at low prices. Since there’s clearly a ceiling to what you can charge, the more the book costs to produce, the less profit there is for the author/publisher. One look told me what the problem was: the author had typeset the entire book in Courier, a monospaced font that’s intended to look like typescript from a typewriter. Courier is a font with many uses, but the text of a book is not one of them. The author told me she had selected Courier because she wanted the book to have a “1950s” look. However, the 1950s were, in many ways, a golden age for book typography. Books were still mostly printed by letterpress, and the materials and processes that were in use represented an evolution of 500 years. Some of the best commercial-quality books ever printed come from this era. But to print a book in Courier in the 1950s would have been almost impossible, unless you created it as an “art” book. Not only that, but if the book was re-set in a standard book face, it would shrink by as much as 40% in page length. Since print on demand vendors like CreateSpace charge by the page, imagine what that would do to her bottom line. She also told me some of the frustration and difficulty she had gone through trying to do her book in Microsoft Word. When I showed her the book design templates for CreateSpace, Lightning Source, and other print on demand vendors available at BookDesignTemplates.com, she was… ecstatic. Both of these authors had done an incredible job getting their books finished and in print. Yet book publishing—especially print book publishing—still has decisions you have to make that have an absolutely critical effect on the success of your project. Just no getting around it. I think you can see why I enjoy going to writers conferences so much, and especially interacting with individual authors and talking about the specifics of their project. If your organization would like me to speak to your group, take a look at my Speaking Page. Okay, time to head out. See you on Wednesday. Very informative post as it guides the young writer for the choice of right publication and printing which has its significance in improving the quality and importance of a book and its author. I’m looking forward to a festival we’ve got coming up in Montana called The Festival of the Book. I contacted the organizers after looking through the schedule. They have nothing at all on eBooks or self-publishing. The closest they come is with a small author-run publishing house in the state. I was quite shocked about this, but they didn’t seem overly concerned. It’ll be interesting to check it out and see what happens. Greg, writers conferences were openly hostile to self-publishing for many years, and it’s only in the past several years they have started to offer sessions on this way of getting into print. I’ve found the atmosphere getting warmer and warmer each year, perhaps as more well-known authors have included self-publishing in their plans. But it’s a real disservice to members if they don’t have something to offer on digital publishing. Good luck. I’m so glad you enjoyed your stay in our little town, Joel. Coalesce is such a gem. It’s one of the reasons I settled here. It sounds as if you were able to help some of the Conference-goers in a big way. Frankie and Lola’s is fairly new and I haven’t been there yet. Thanks for the review! So sad I wasn’t there to meet you. Hope we will meet sometime soon. I really had fun exploring Morro Bay in the little time I had, Anne, and I can see the appeal. Perhaps we’ll bet to meet up at the SF Writers Conference, if you’re planning to attend in February. That’s a great comment about the typography connecting to cost that I think a lot of people miss. The font you choose has not only stylistic implications, but a real impact on the bottom line for making a profit. Striking a balance between legibility, easy flow of written word, compact layout, and the overall page count of the work blurs the line between art and science. Most people probably don’t realize that the bulk of the work we do on the templates are getting these balances just right to deliver the best type to read, while using the least number of pages to get there. Small choices, even changing a line space by 1/72nd of an inch, can make a big difference over 70,000 words. Very true, Tracy, and that’s one of the best reasons to get a professional in the book business to have a look at your project before you get too deep into it. And it’s true that just about every change you make to a book interior can have large effects as it flows through hundreds of pages and thousands of line endings. Joel, I loved everything about this post. I loved the specifics of what you told the 75 year old woman with her first book, the generosity towards all the new writers and enthusiasm for their projects, the Morro Bay bookstore (which I know and love), and the breakfast joint (which I don’t know and must visit for those skillet potatoes.) It’s great thinking of you out there: Traveling Book Creator. Thanks, Susie. Traveling book creator indeed. You won’t be disappointed with a visit to Frankie & Lola’s, but here’s a tip: get there early.